This year, we will be navigating the complexities of the often blurred lines between dogma and culture. Find where you stand (and where you should be standing) as we explore together our Church’s core beliefs and the effect and role of various, and oftentimes conflicting, cultures. We’ll be once again blessed to have H.G. BISHOP SERAPION along with H.G. 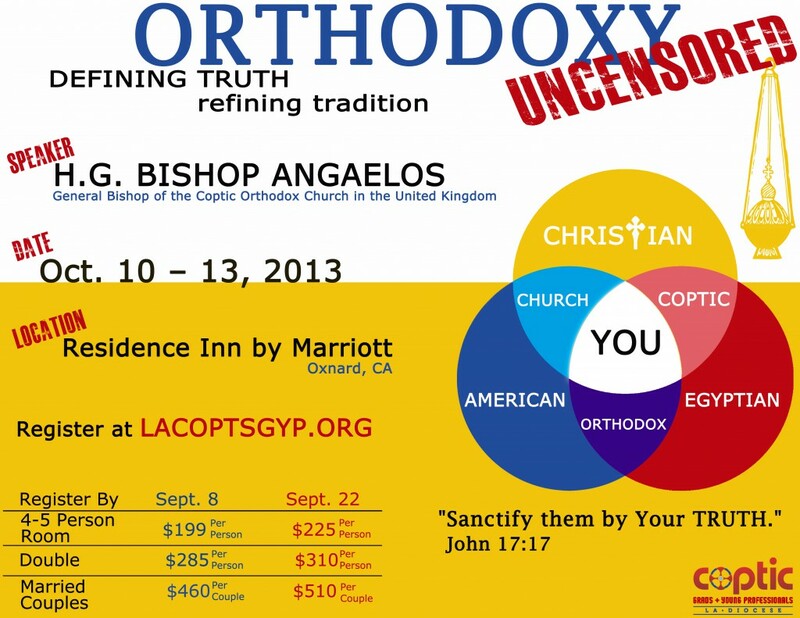 BISHOP ANGAELOS of the UK to steer us in the right direction. LAST YEAR WE HAD TO CLOSE REGISTRATION EARLY, so don’t wait until the last minute to decide to join us for a weekend of fellowship filled with quiet times, group discussions, intriguing topics, midnight praises, liturgy, and organized activities! NOTE: Registration is NOW OPEN, but will CLOSE Midnight of September 22nd or when all rooms are filled, whichever comes first.